Young Scientist, July 13, 2011: Neptune, the eight planet in the solar system, is back to where it was spotted in 1846. It took about 165 Earth years to make one orbit around the Sun, since it is weakly bound by the Sun’s gravitational force at a distance of 2.8 billion kilometers. The other planets in the sky are observed and discovered accidentally, but Neptune was discovered through scientific calculations and mathematical predictions. The French mathematician, Urbain Joseph Le Verrier, and, independently, the British astronomer and mathematician, John Couch Adams, predicted the existence of Neptune when it was found that Uranus was not moving as it should, indicating a gravitational pull by another massive body. Le Verrier calculated the mass and position of this celestial body that changes the orbit of Uranus. He sent his calculations to Johann Gottfried Galle at the Berlin Observatory, after being rejected fellow French astronomers. And, he found Neptune, at the location less than a degree from Le Verrier’s prediction, over a period of two nights 1846 and 17 days later, Triton, its largest moon was also discovered by British astronomer William Lassell. Though not as a planet, Galileo, the Italian Astronomer, noted Neptune in December 1612. He mistook it as a star, and noted again a month later that it has moved its position relative to other stars. 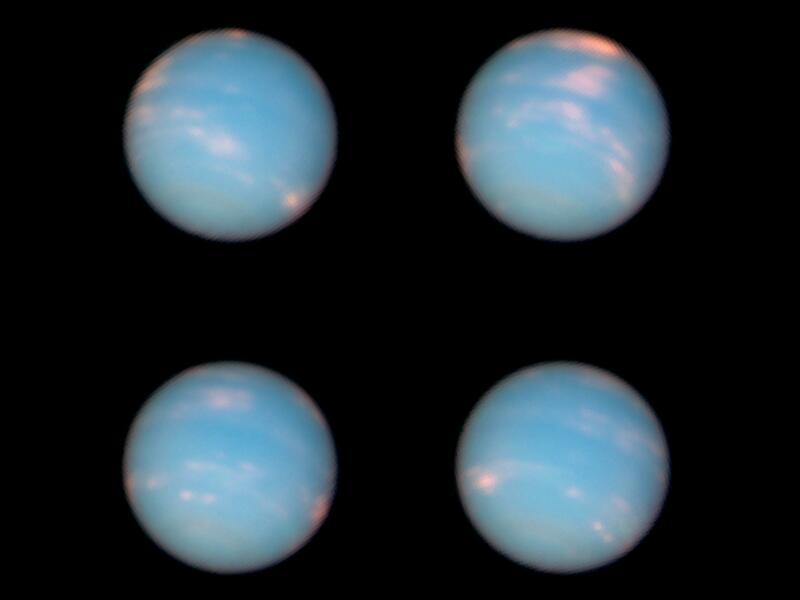 Images of Neptune taken by Hubble on June 25-26, 2011. High altitude clouds, com[osed of methane ice crystals are visible in the northern and southern hemispheres. The planet’s blue-green color is due to the absorption of red light by methane. The clouds reflect the near infra-red and therefore, appears red. The images were taken at an interval of 4 hours. Image credit: NASA, ESA, and the Hubble Heritage Team (STScI/AURA). Neptune was discovered on September 23, 1846.It is the farthest planet in the solar system as pluto lost its status as a planet. Neptune takes about 16 days to spin on its own axis, which is tilted about 29° (Earth has a tilt of 23°). An interesting fact is that Neptune’s seasons last nearly 40 years! It is the beginning of summer in the southern hemisphere and winter in the northern hemisphere. Neptune has a surface temperature of about -218° Celsius (55 K, absolute) and you ca imagin how cold it will be there. It has about 13 known moons and the largest and the most studied one is the Triton. It orbits Neptune in the direction opposite to the spinning direction of Neptune, known as retrograde orbit. Neptune is not visible to the naked eye, but binoculars and small telescopes can see it. It has a magnetic field 27 times stronger than that of the Earth and undergoes wild variations. The magnetic equator is at an angle of 47° to the geographic equator. Extremely fast winds have been detected on the surface of Neptune, reaching more than 2000 km/h.